Vidyarthi Vigyan Manthan (VVM) is an initiation of Vijnana Bharati (VIBHA), in collaboration with National Council of Education Research and Training, an institution under the Ministry of Human Resource Development and Vigyan Prasar, an autonomous organisation under the Department of Science and Technology, Government of India. 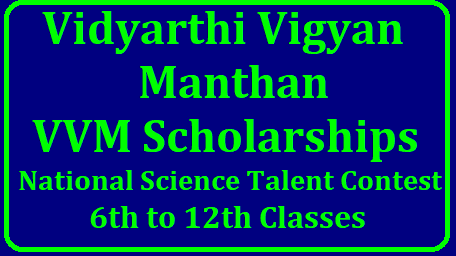 VVM is a National program for educating and popularizing science among school students of VI to XI standards. VVM aims to identify and nurture the bright minds among the student community, who are keen on subjects related to science. There will be only one examination of 2 hours at school level with 100 multiple choice questions each weighted for 1 mark. The examination will be conducted for the Junior Group (class VI to VIII) and for the Senior Group (class IX to XI). Evaluation of student will be based on their individual performance at every level. The examination will be conducted in English, Hindi, Marathi, Tamil and Telugu. LAST DATE EXTENDED UPTO OCTOBER 10TH 2018.